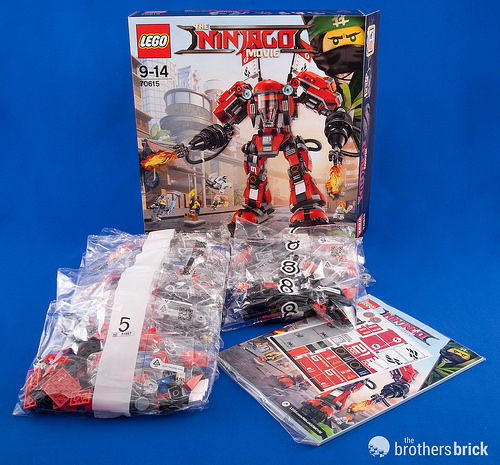 The LEGO Ninjago Movie hits theaters in a few weeks, on September 22, and we’re continuing our reviews of the LEGO sets released to support the movie. 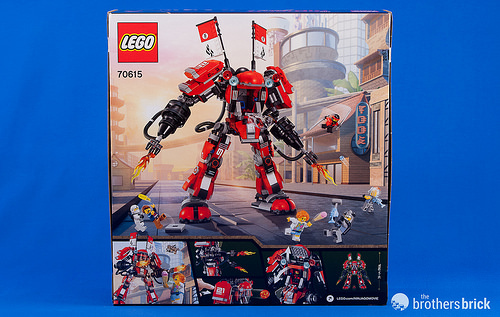 The movie tie-in line includes a number of mecha, with 70615 Fire Mech coming in at 944 pieces and 6 minifigs at $69.99. 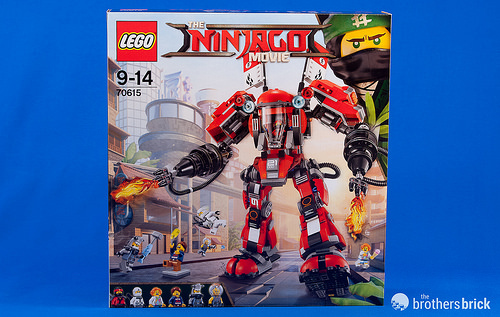 The box is a standard LEGO box, with a back that illustrates the mech’s play features. The parts for the mech come in 8 numbered bags, with the instruction booklet and sticker sheet in their own bag. 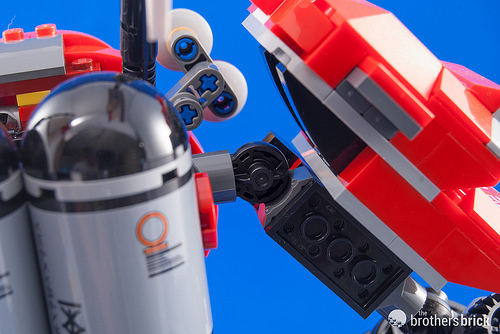 The first bag includes half of the six minifigs, along with the parts for the back two thirds of the mech’s body. 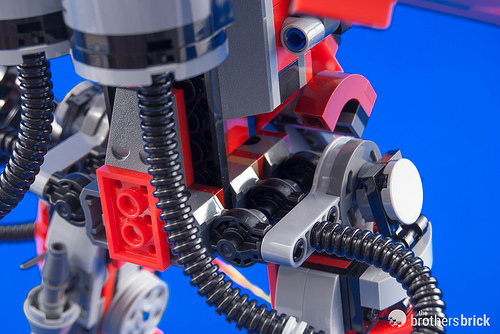 The body is built studs-forward, and serves as the base for all the connections needed to attach the arms and legs with Technic rotation joints. These joints don’t stand up well under the weight of a mid-size mecha, so each leg uses three joints, reinforced by a rotation joint with an attached liftarm. The second bag finishes the cockpit section, with a top that flips up and canopy that flips forward. 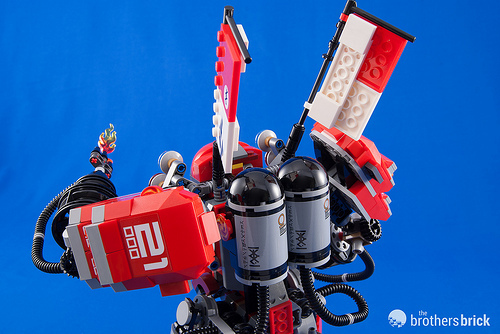 The “roof” of the mech is a little bit floppy — connected to the body with hinges, it doesn’t move up and down smoothly, and just sets in either the up or down positions using gravity rather than friction. The set relies heavily on stickers, with a sheet sporting more than thirty stickers. The third bag includes the parts for the right arm, and the fourth bag the parts for the left. 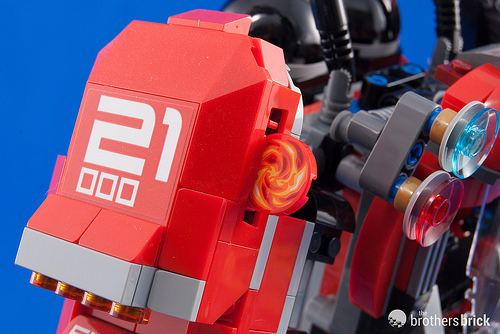 The huge shoulder armor houses a mechanism for firing 2×2 round tiles, which are printed with a swirling fire pattern. You build the right leg from the fifth bag and the left leg from the sixth, with the detailed feet in the seventh bag. 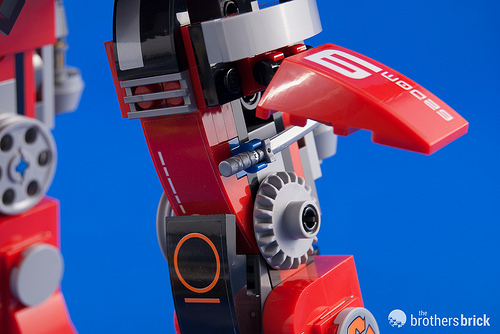 The legs are as detailed as the arms, with gears where the knees should be. However, the knees don’t actually hinge, and the knee details are just cosmetic. The eighth bag completes the set with the fuel tanks and flags for the mech’s back. 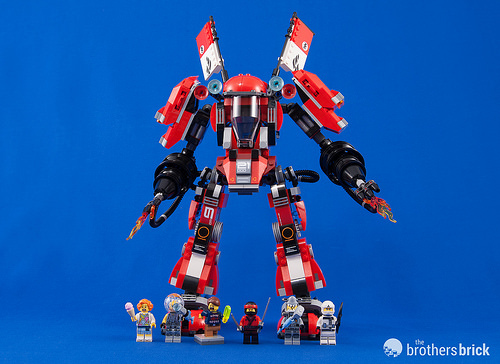 70615 Fire Mech includes the ninjas Kai and Zane, along with civilians Lauren and Henry, plus baddies Hammer Head and Jelly. 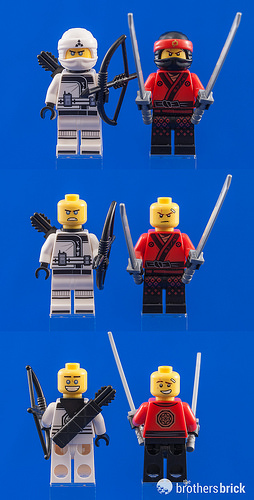 The two ninjas are wearing your run-of-the-mill ninja attire, though both minifigs have reversible heads for two facial expressions. Henry wears a shirt with text on front and back in the pseudo-Asian font invented for Ninjago. I’ll leave our intrepid commenters to decipher the text. Lauren has a dress with a scalloped design and blue sash, with sandals printed on her toes. 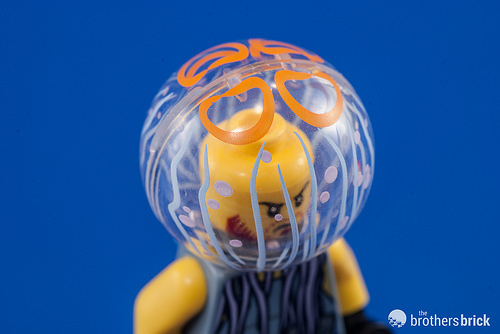 Both minifigs also have reversible heads. 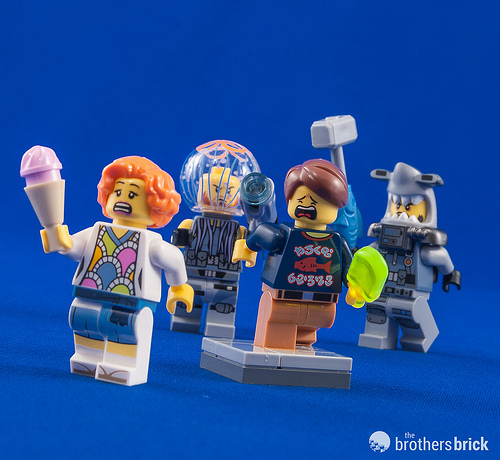 The two members of Lord Garmadon’s Shark Army sport nautically themed attire, with one wearing a printed dome and the other wearing a hammerhead shark. Their weapons both integrate light blue fish. 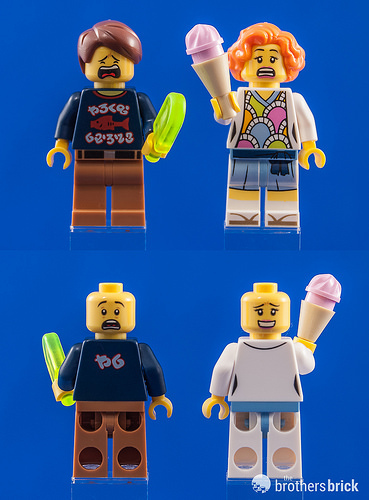 As with all the other minifigs, their heads are double-printed. The domed helmet is interesting because it’s a printed version of Sandy Cheeks’ helmet from the Spongebob Squarepants LEGO sets. The printing appears to be of a jellyfish, and the design extends down onto the character’s torso. 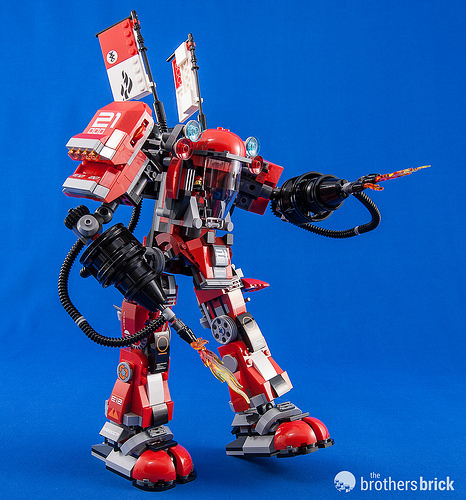 Once finished, it’s clear that the mech seems to be built from the parts of a fire truck, though it remains to be seen (in the movie) how that will come about. 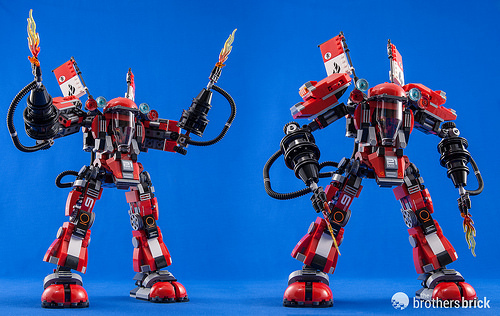 The mech stands over a foot tall, and both arms are highly posable, though having two flame-throwers instead of at least one manipulator arm seems impractical and somewhat redundant — the fire mech can roast stuff at close quarters, but it can’t pick anything up. Unfortunately, the mech’s missing knee joints causes a lack of posability that prevents the mech from taking much more than the feet apart, arms ready for action mecha pose. In fact, the level of posability that the legs do provide makes for some less-than-kickass stances. 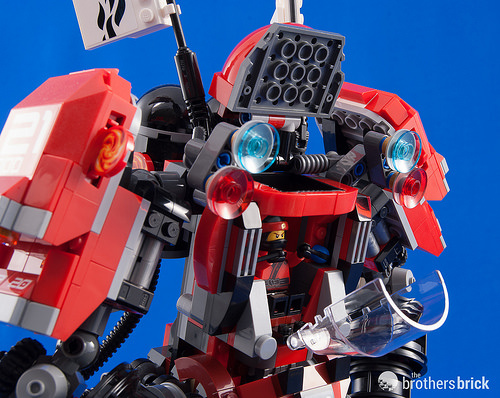 Nevertheless, with detail from top to bottom and front to back, the overall design of the mecha would actually look right at home on the mecha table full of fan-designed creations at any LEGO convention. And honestly, that is high praise indeed. 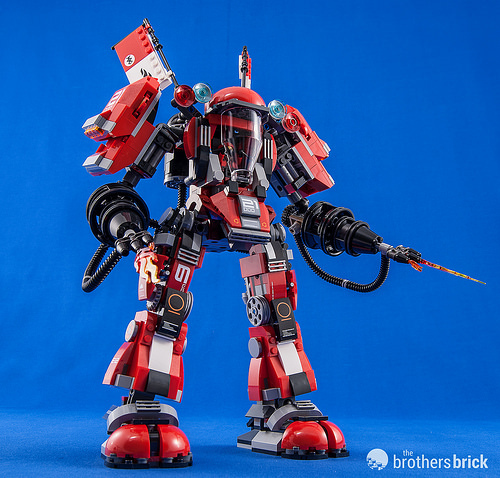 At over 940 pieces for only $70, 70615 Fire Mech is quite a steal, with lots of interesting slopes and rounded pieces in red plus plenty of detail pieces in grays and black. 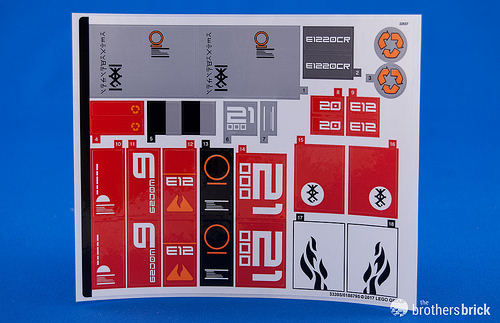 The sticker sheet is also sure to be highly desirable among sci-fi builders. Despite some of the flaws I’ve pointed out earlier in this review (most notably the missing knee joints), this is actually a pretty excellent set, with an overall design that would look at home among the best fan-designed creations. The photo seems to be at odds with the text here. I’m not a big fan of the model, but this looks like a fantastic parts bounty for spaceships.